A farmer near Giroux, Man. 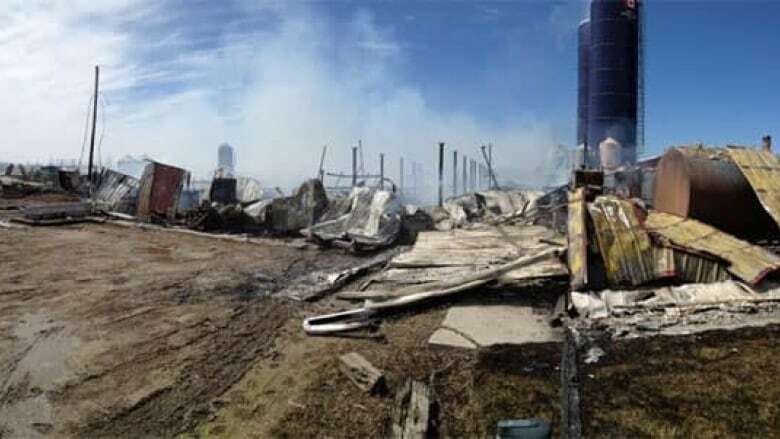 is devastated after a massive fire killed the majority of the livestock on his dairy farm Saturday morning. Welden Plett told CBC News the fire broke out at about 9:17 a.m., but the cause of the fire has not yet been determined. He said he wasn't home Saturday morning, but his brother spotted the flames and contacted him. Local fire crews were on the farm battling the blaze. Plett said 103 cows were killed in the fire — he managed to save 60 cows. He said he was still in disbelief about how much his family has lost. "At this point we're all still pretty much in shock," said Plett. "We have no idea what direction to turn to at this point, but we've had other curveballs thrown at us, you keep going. So who knows, it's too early to tell what we're going to do," he said. Plett said he has moved the remaining cattle to a neighbour's farm. Giroux is located about 60 kilometres southeast of Winnipeg.